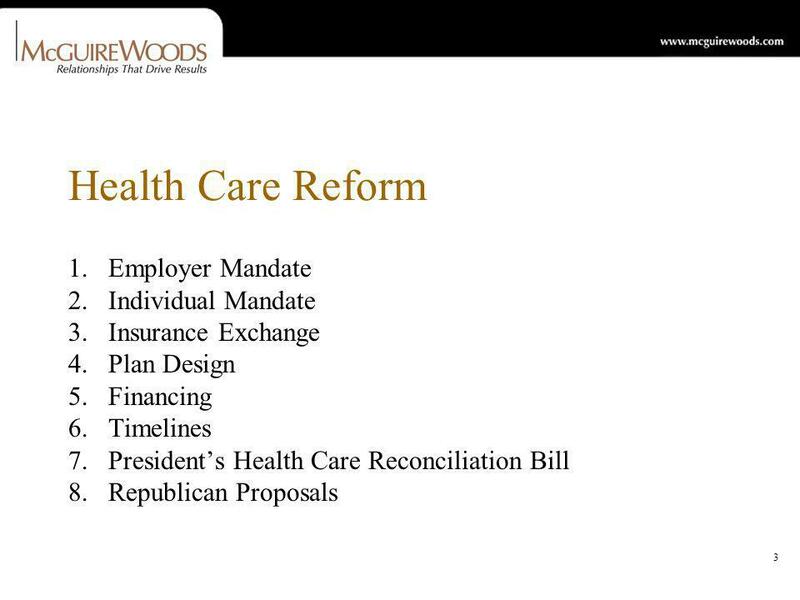 1 New Developments Affecting Employee Benefit Plans The North Florida Chapter of the Association of Corporate Counsel February 23, 2010. 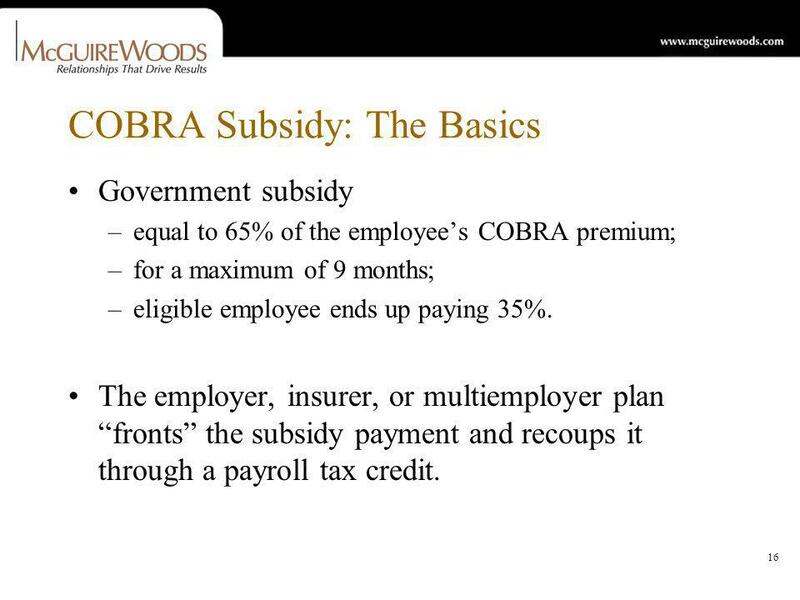 16 16 COBRA Subsidy: The Basics Government subsidy –equal to 65% of the employees COBRA premium; –for a maximum of 9 months; –eligible employee ends up paying 35%. 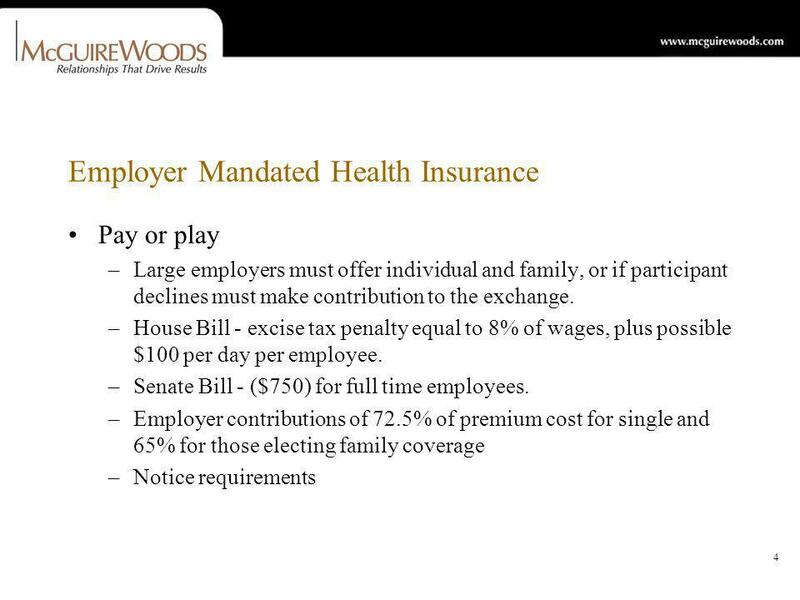 The employer, insurer, or multiemployer plan fronts the subsidy payment and recoups it through a payroll tax credit. 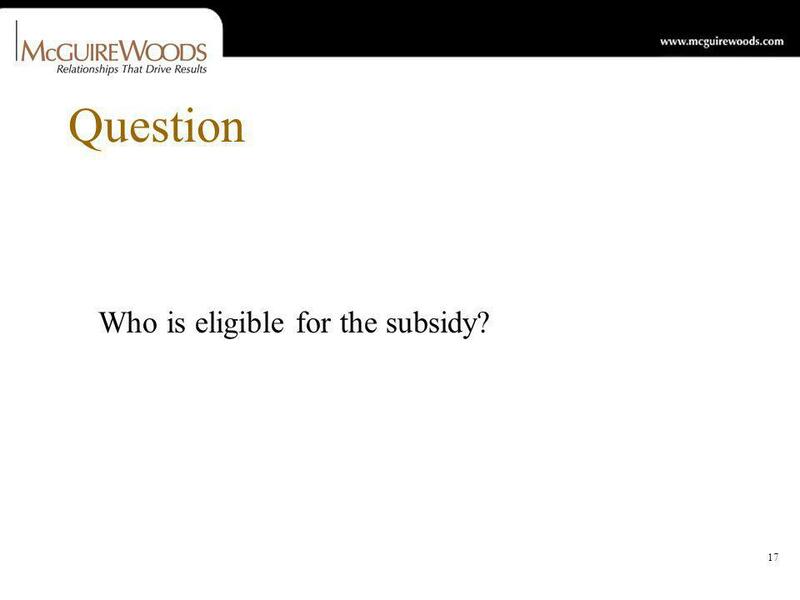 17 17 Question Who is eligible for the subsidy? 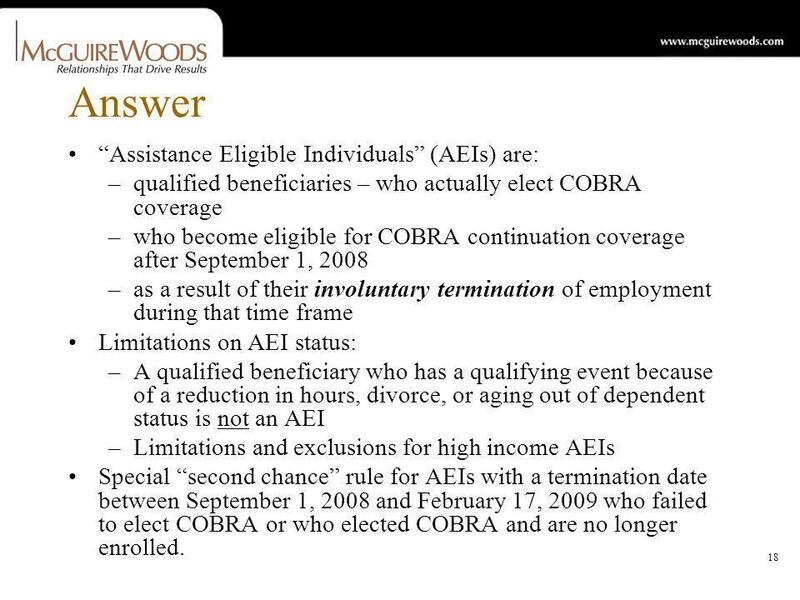 18 18 Answer Assistance Eligible Individuals (AEIs) are: –qualified beneficiaries – who actually elect COBRA coverage –who become eligible for COBRA continuation coverage after September 1, 2008 –as a result of their involuntary termination of employment during that time frame Limitations on AEI status: –A qualified beneficiary who has a qualifying event because of a reduction in hours, divorce, or aging out of dependent status is not an AEI –Limitations and exclusions for high income AEIs Special second chance rule for AEIs with a termination date between September 1, 2008 and February 17, 2009 who failed to elect COBRA or who elected COBRA and are no longer enrolled. 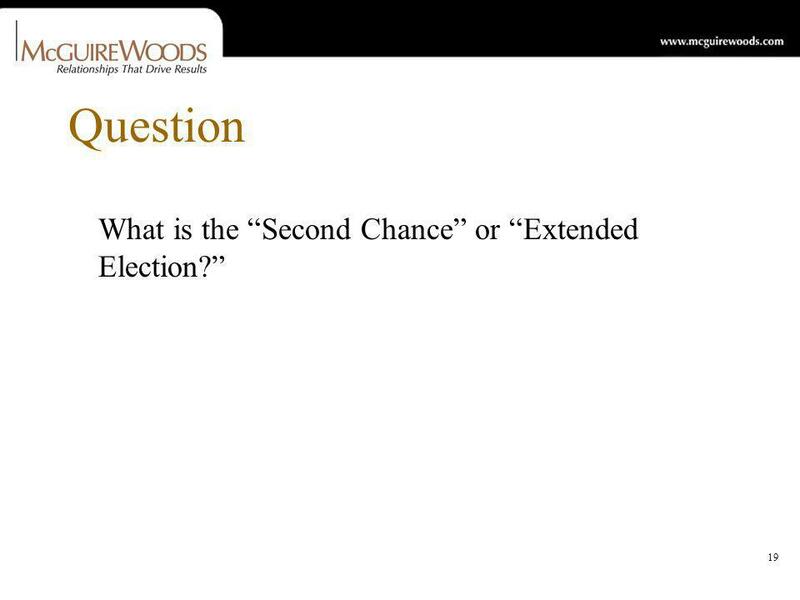 19 19 Question What is the Second Chance or Extended Election? 20 20 Answer AEIs who: –terminated before February 17, 2009 (but after September 1, 2008) and failed to elect COBRA; or –terminated before February 17, 2009 (but after September 1, 2008) and elected COBRA but are no longer covered as of February 17, 2009 Have a second chance to elect COBRA coverage by electing subsidized COBRA coverage. 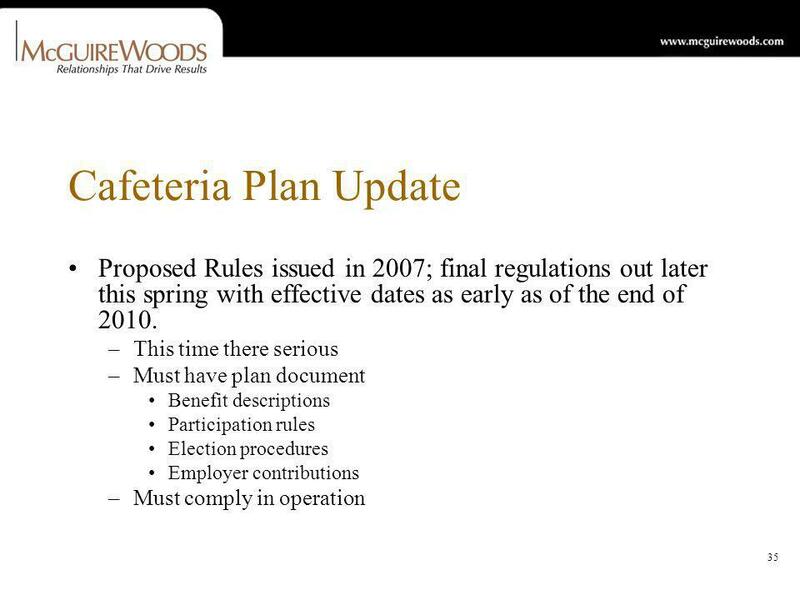 Notice must be provided to AEIs by April 18, 2009. Model notices have been provided by the Department of Labor. Elections must be made in 60 days following receipt of the notice (retroactive to February 17, 2009); 35% premium payment must be made in 45 days after the date of the election (premium will be retroactive to February 17, 2009). 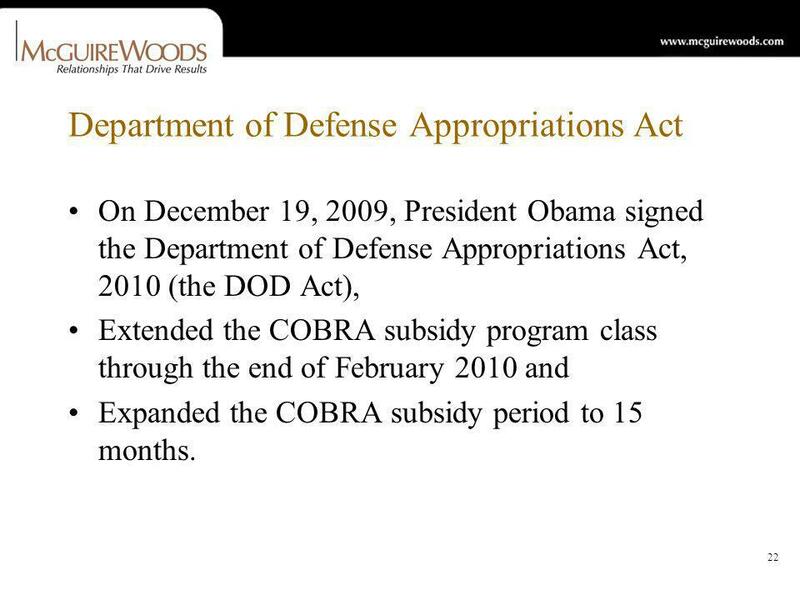 22 22 Department of Defense Appropriations Act On December 19, 2009, President Obama signed the Department of Defense Appropriations Act, 2010 (the DOD Act), Extended the COBRA subsidy program class through the end of February 2010 and Expanded the COBRA subsidy period to 15 months. 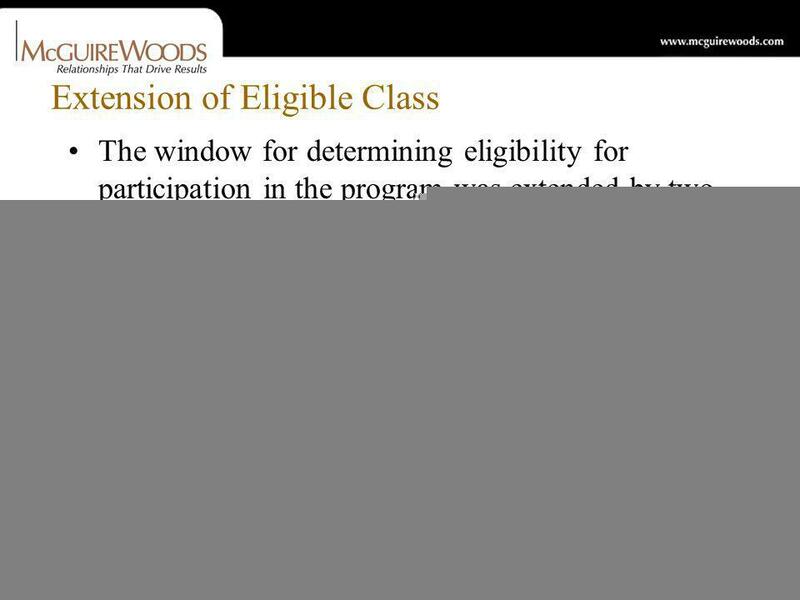 23 23 Extension of Eligible Class The window for determining eligibility for participation in the program was extended by two months. 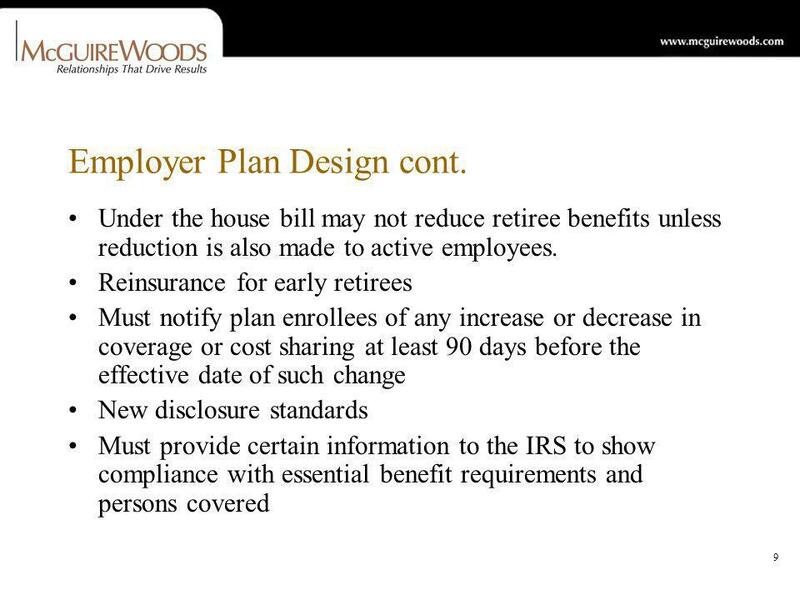 The revised program will apply to individuals who lose their group health plan coverage due to an involuntary termination of employment between January 1, 2010 and February 28, 2010. 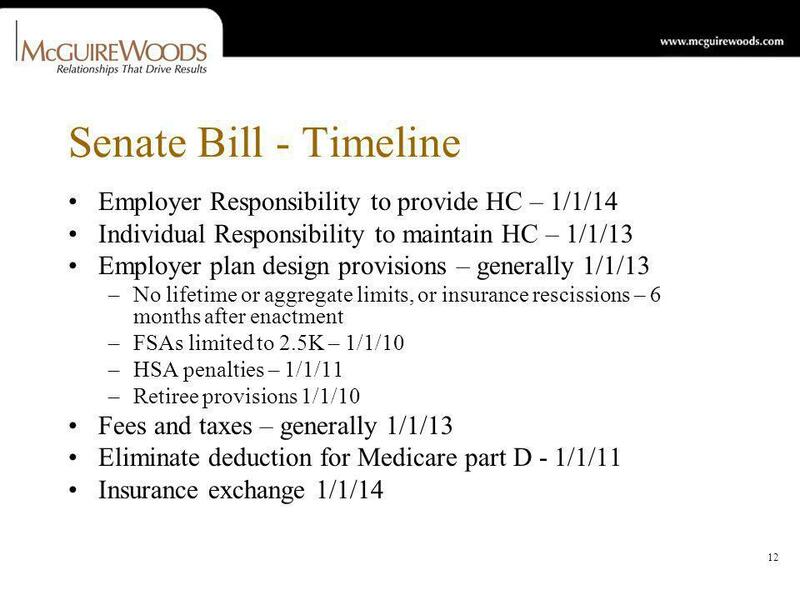 Under ARRA, the deadline was December 31, 2009. 24 24 Extension of Subsidy Period The DOD Act extended the duration of the subsidy by six months. 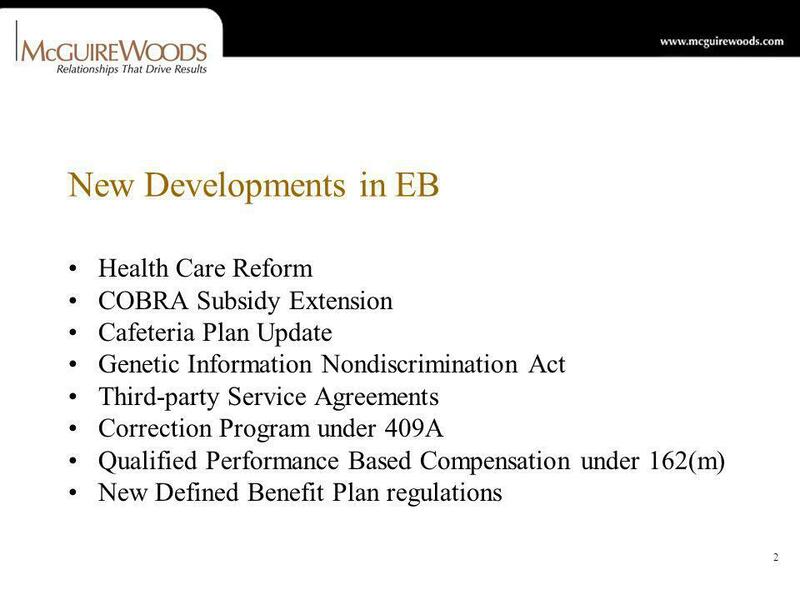 –All AEIs may participate in the COBRA subsidy program for a total of 15 months, rather than the previous nine months. 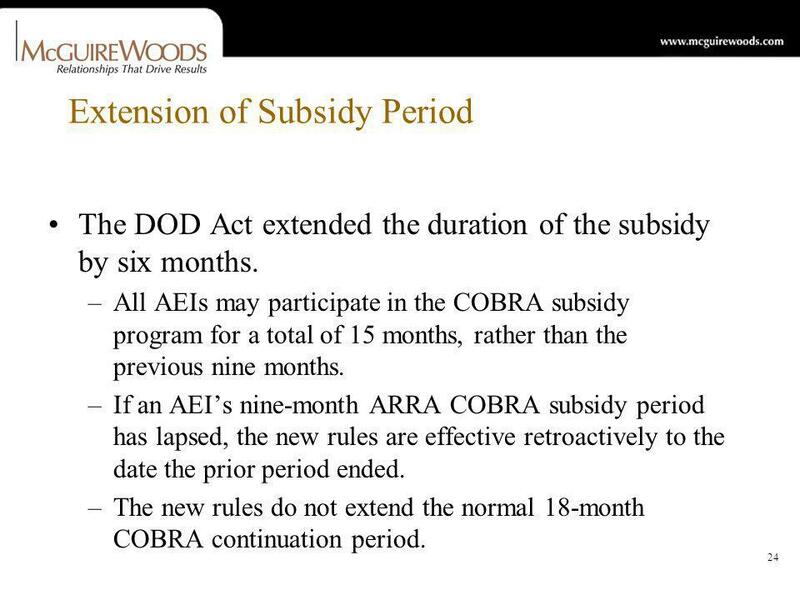 –If an AEIs nine-month ARRA COBRA subsidy period has lapsed, the new rules are effective retroactively to the date the prior period ended. –The new rules do not extend the normal 18-month COBRA continuation period. 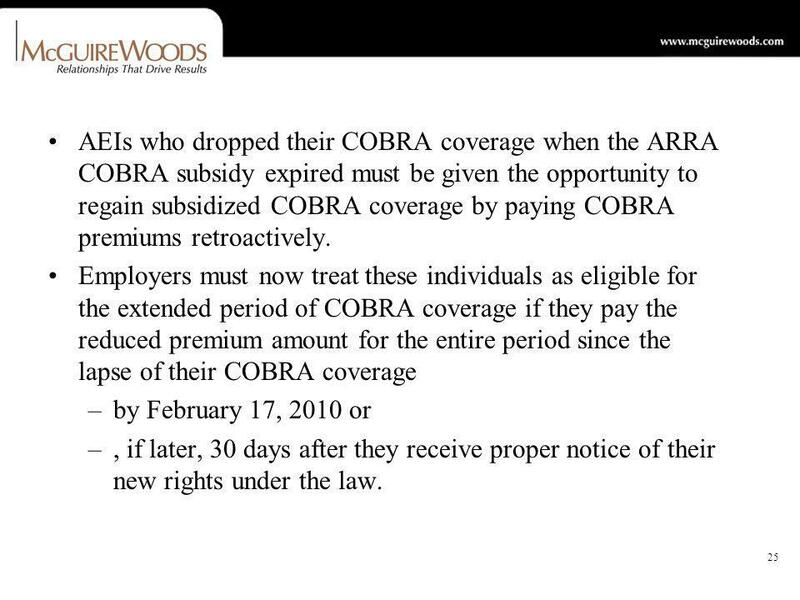 25 25 AEIs who dropped their COBRA coverage when the ARRA COBRA subsidy expired must be given the opportunity to regain subsidized COBRA coverage by paying COBRA premiums retroactively. 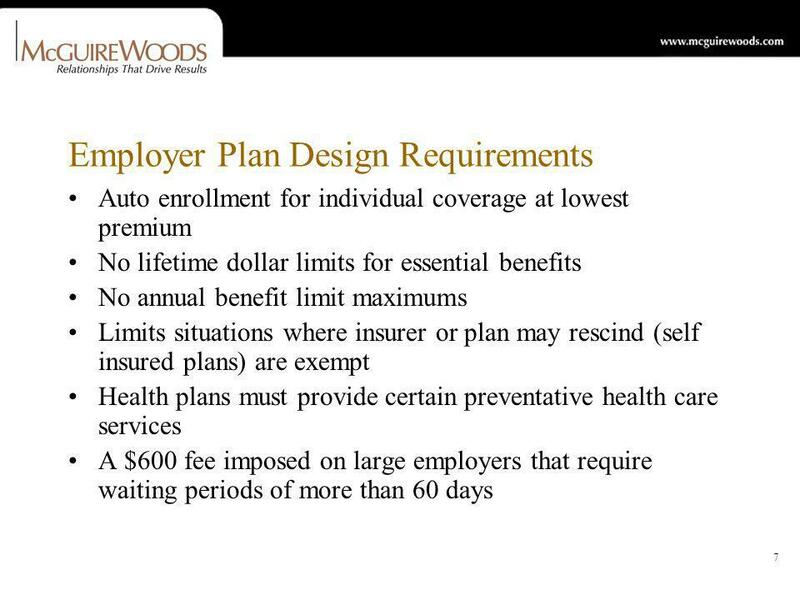 Employers must now treat these individuals as eligible for the extended period of COBRA coverage if they pay the reduced premium amount for the entire period since the lapse of their COBRA coverage –by February 17, 2010 or –, if later, 30 days after they receive proper notice of their new rights under the law. 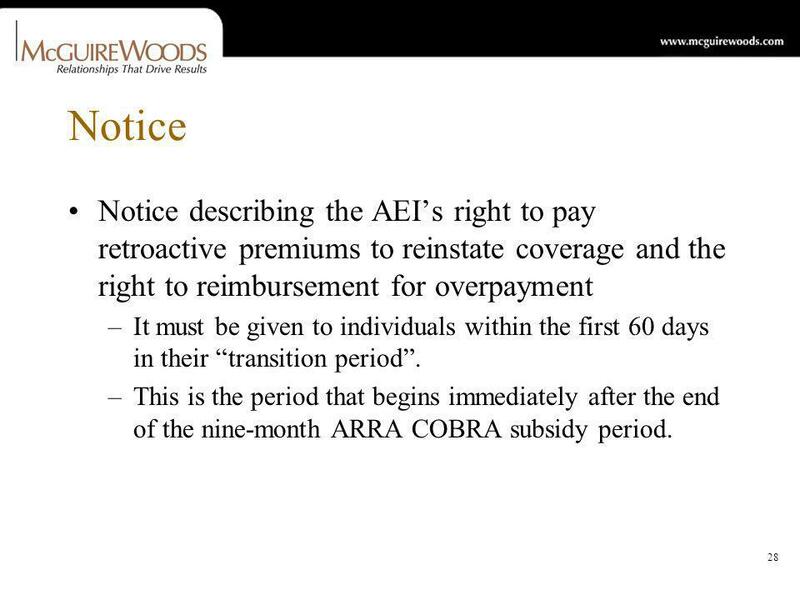 26 26 AEIs who continued to pay full COBRA premiums for coverage following the lapse of the ARRA subsidy are entitled to reimbursement for their payment of the 65% subsidy. 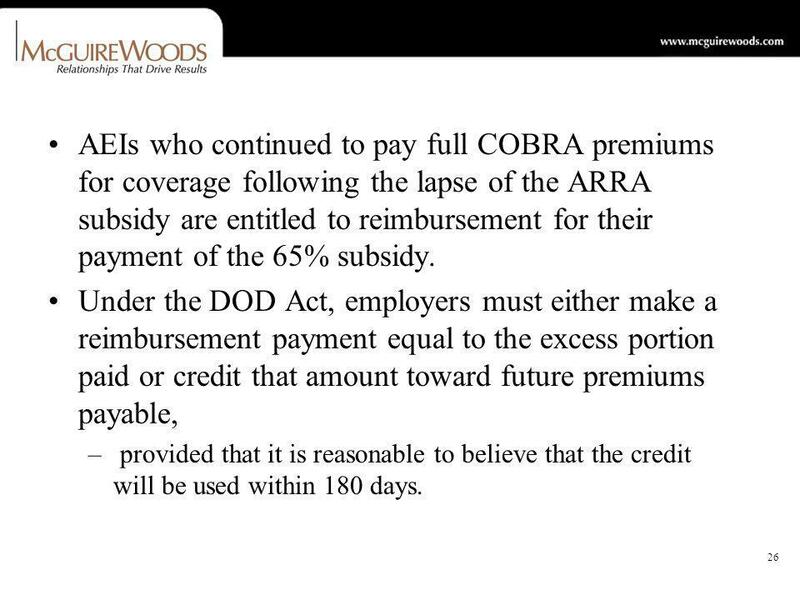 Under the DOD Act, employers must either make a reimbursement payment equal to the excess portion paid or credit that amount toward future premiums payable, – provided that it is reasonable to believe that the credit will be used within 180 days. 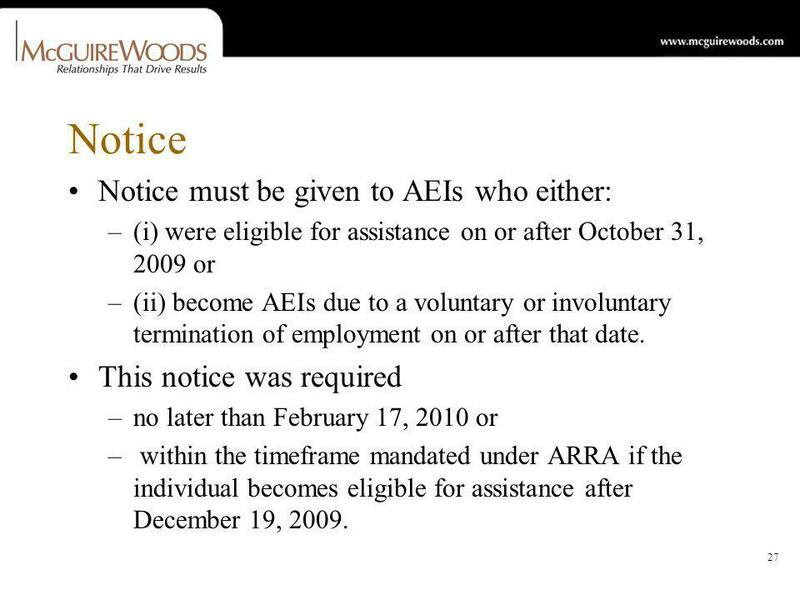 27 27 Notice Notice must be given to AEIs who either: –(i) were eligible for assistance on or after October 31, 2009 or –(ii) become AEIs due to a voluntary or involuntary termination of employment on or after that date. 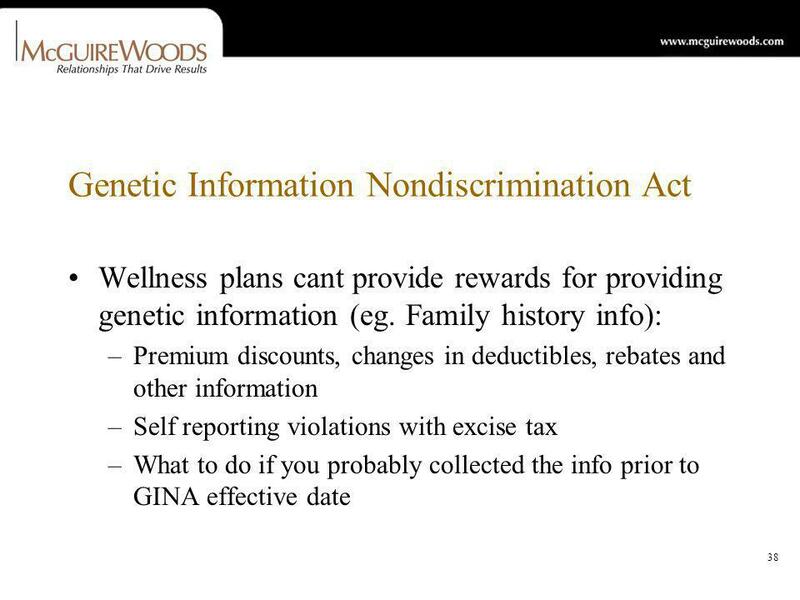 This notice was required –no later than February 17, 2010 or – within the timeframe mandated under ARRA if the individual becomes eligible for assistance after December 19, 2009. 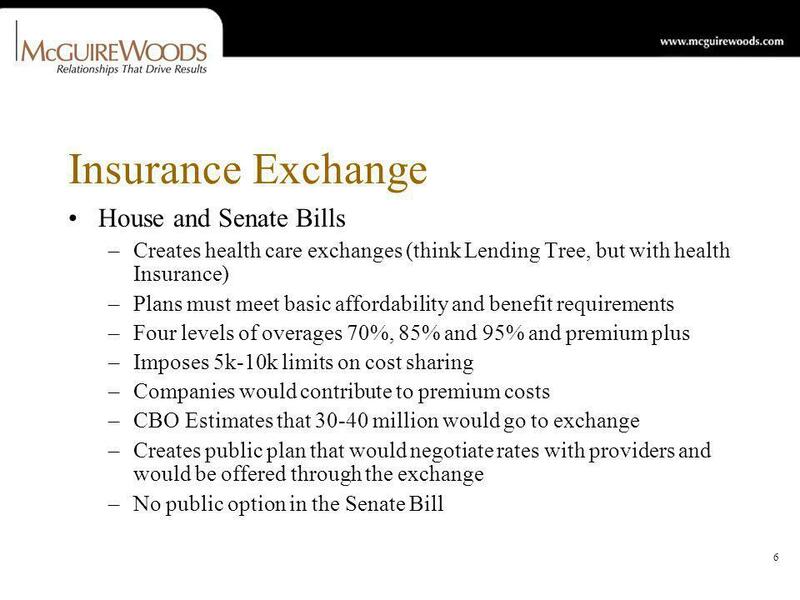 28 28 Notice Notice describing the AEIs right to pay retroactive premiums to reinstate coverage and the right to reimbursement for overpayment –It must be given to individuals within the first 60 days in their transition period. 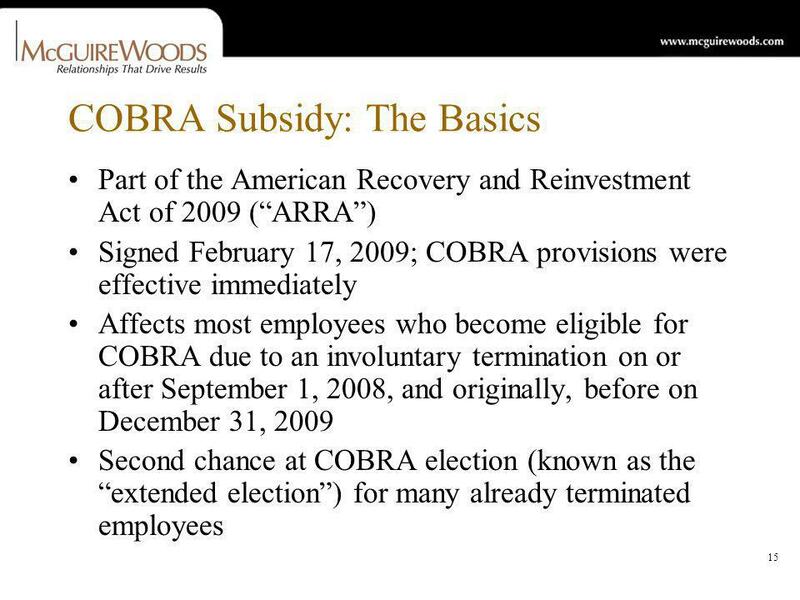 –This is the period that begins immediately after the end of the nine-month ARRA COBRA subsidy period. 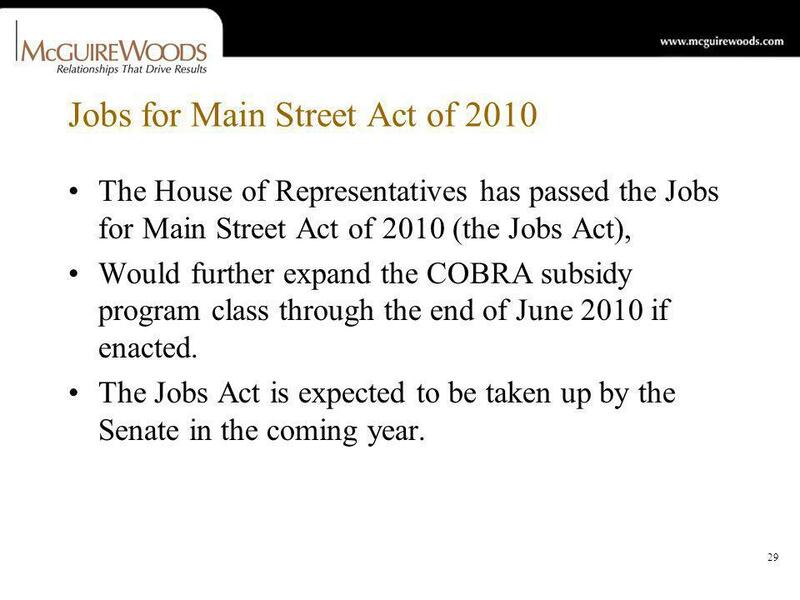 29 29 Jobs for Main Street Act of 2010 The House of Representatives has passed the Jobs for Main Street Act of 2010 (the Jobs Act), Would further expand the COBRA subsidy program class through the end of June 2010 if enacted. The Jobs Act is expected to be taken up by the Senate in the coming year. 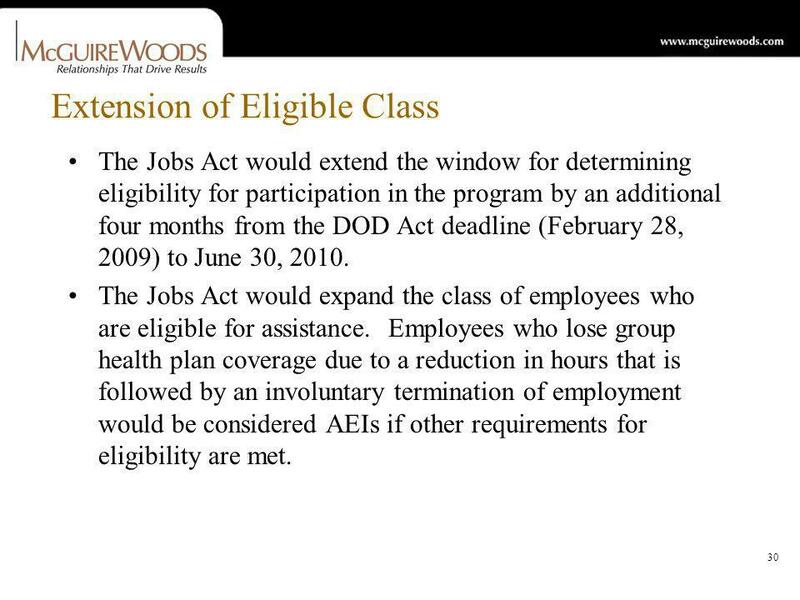 30 30 Extension of Eligible Class The Jobs Act would extend the window for determining eligibility for participation in the program by an additional four months from the DOD Act deadline (February 28, 2009) to June 30, 2010. 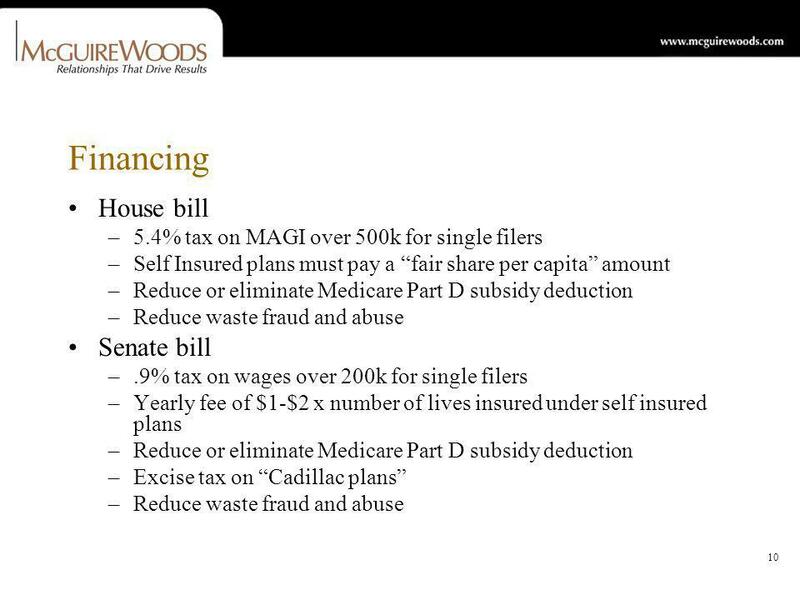 The Jobs Act would expand the class of employees who are eligible for assistance. 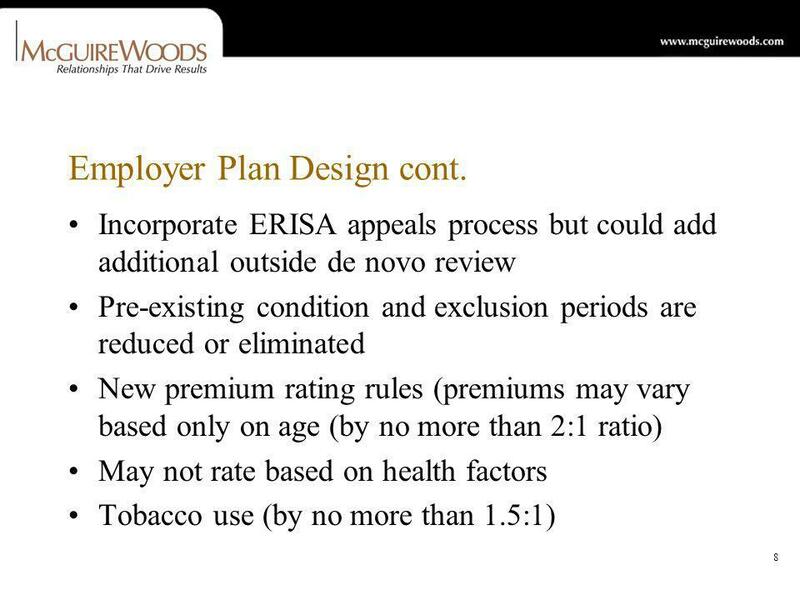 Employees who lose group health plan coverage due to a reduction in hours that is followed by an involuntary termination of employment would be considered AEIs if other requirements for eligibility are met. 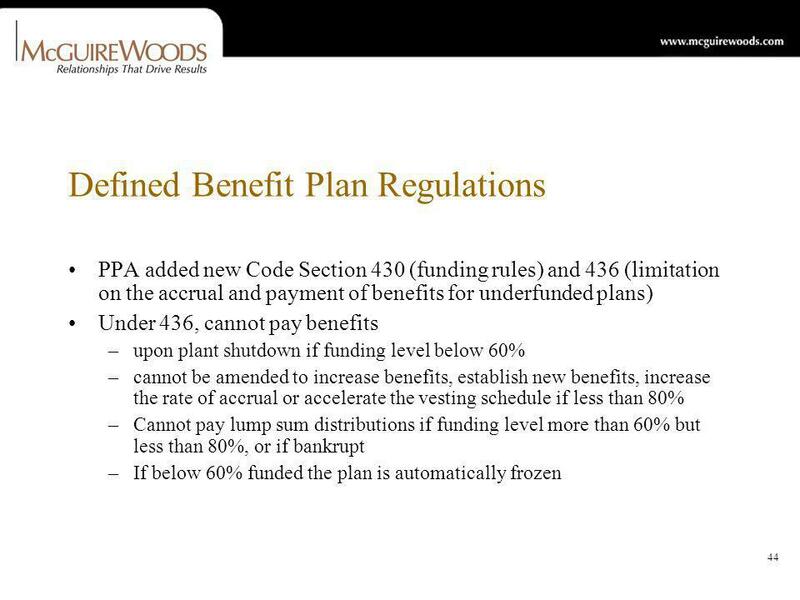 31 31 Retiree Health Plan Coverage Under current law, individuals who are eligible for post-employment coverage under certain types of retiree health plans are not eligible for the COBRA subsidy. 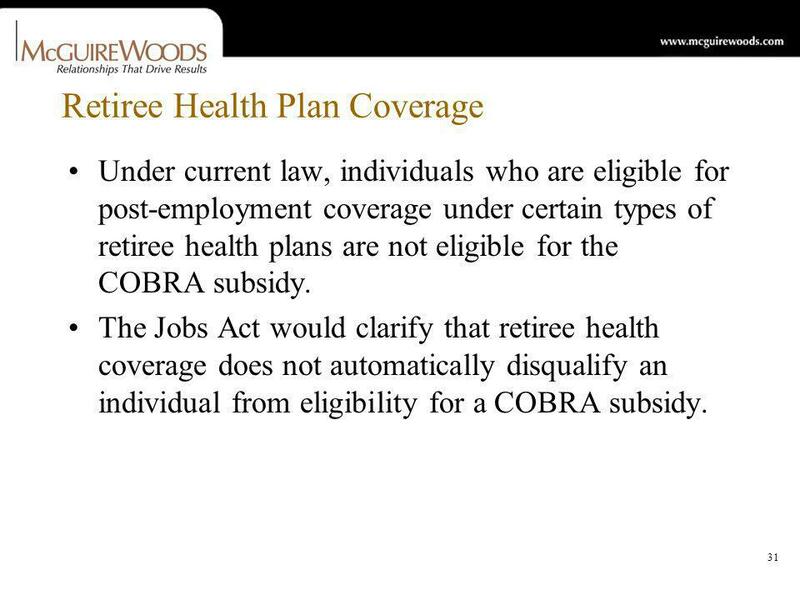 The Jobs Act would clarify that retiree health coverage does not automatically disqualify an individual from eligibility for a COBRA subsidy. 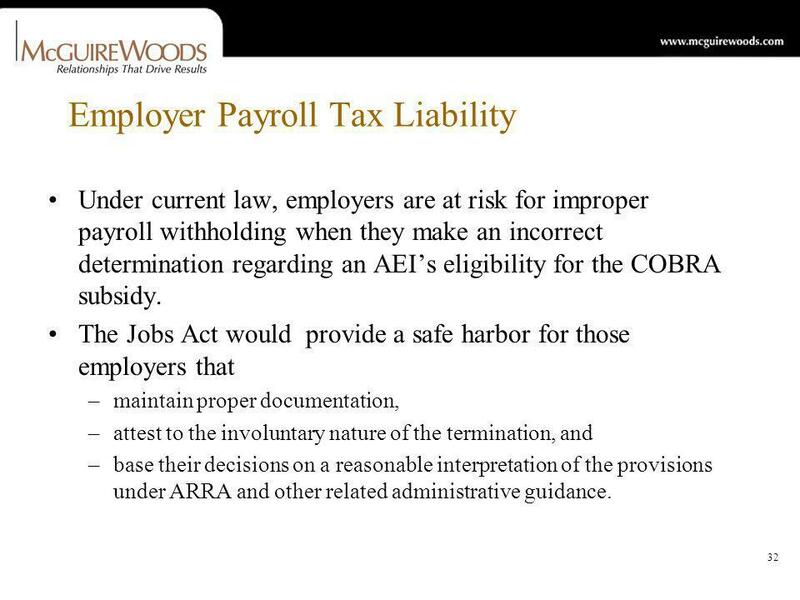 32 32 Employer Payroll Tax Liability Under current law, employers are at risk for improper payroll withholding when they make an incorrect determination regarding an AEIs eligibility for the COBRA subsidy. The Jobs Act would provide a safe harbor for those employers that –maintain proper documentation, –attest to the involuntary nature of the termination, and –base their decisions on a reasonable interpretation of the provisions under ARRA and other related administrative guidance. 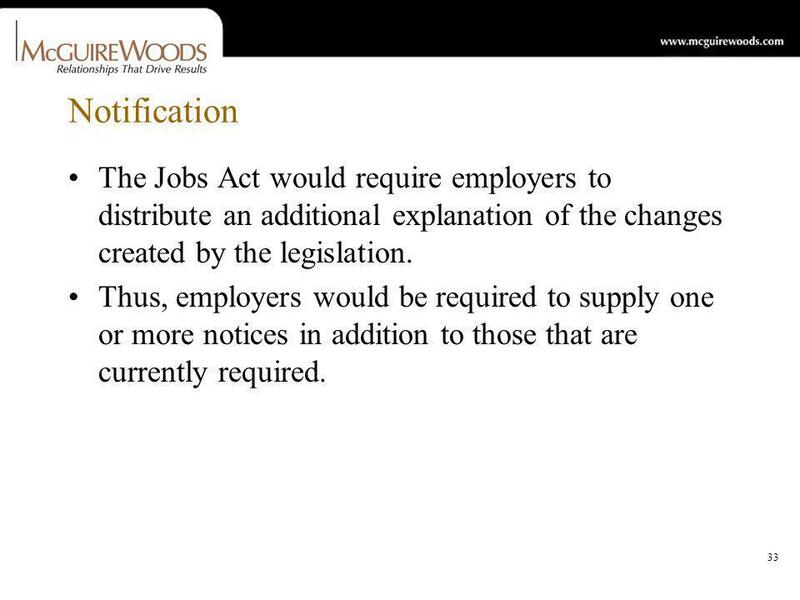 33 33 Notification The Jobs Act would require employers to distribute an additional explanation of the changes created by the legislation. 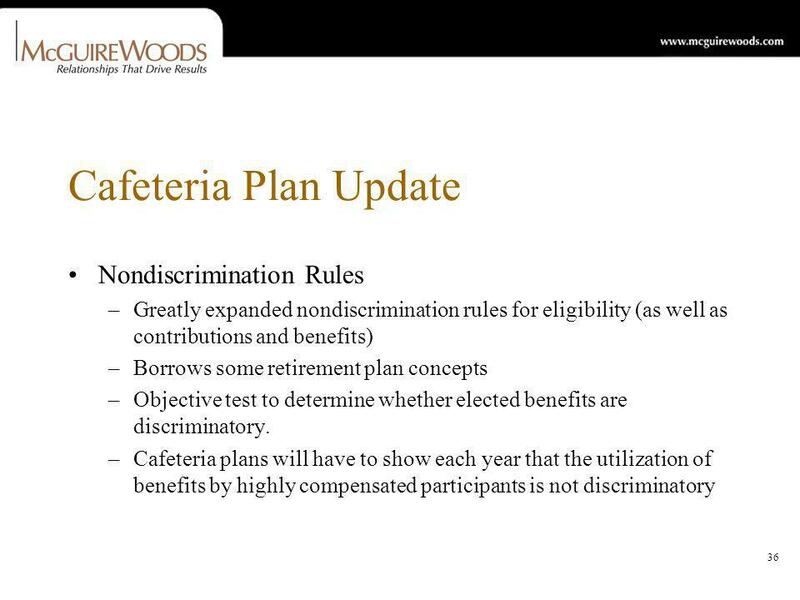 Thus, employers would be required to supply one or more notices in addition to those that are currently required. 34 34 Penalties for Non-Compliance The Jobs Act would expose employers to increased penalties for violations of ARRA provisions. 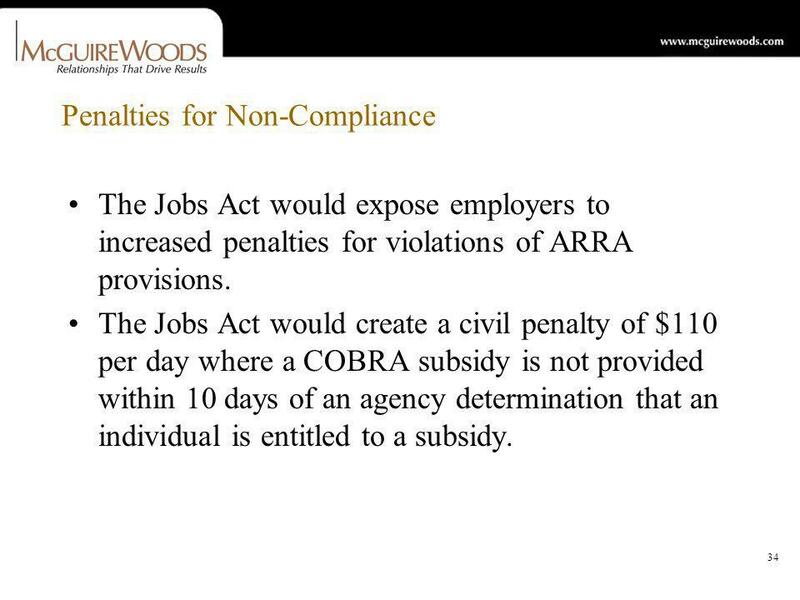 The Jobs Act would create a civil penalty of $110 per day where a COBRA subsidy is not provided within 10 days of an agency determination that an individual is entitled to a subsidy. 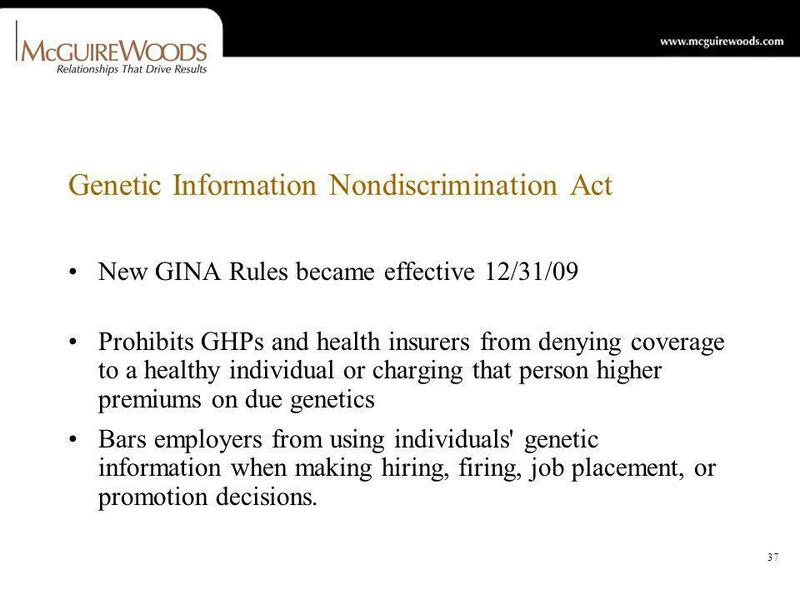 37 37 Genetic Information Nondiscrimination Act New GINA Rules became effective 12/31/09 Prohibits GHPs and health insurers from denying coverage to a healthy individual or charging that person higher premiums on due genetics Bars employers from using individuals' genetic information when making hiring, firing, job placement, or promotion decisions. 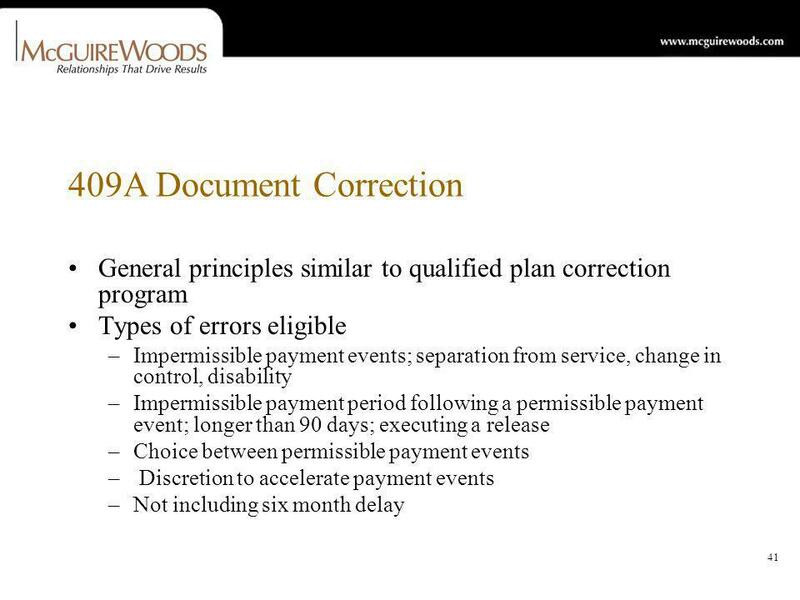 39 39 Third-Party Service Agreements The Employer shall fully indemnify TPS and hold it harmless from loss or liability, including reasonable legal fees and costs, which TPS sustains in discharging its duties and responsibilities under this Agreement, unless such loss or liability directly results from TPSs gross negligence or willful misconduct. 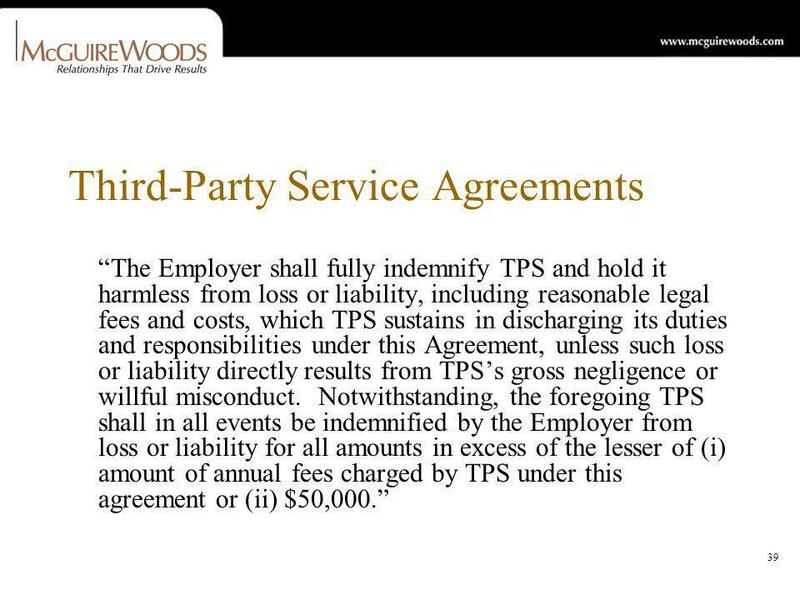 Notwithstanding, the foregoing TPS shall in all events be indemnified by the Employer from loss or liability for all amounts in excess of the lesser of (i) amount of annual fees charged by TPS under this agreement or (ii) $50,000. 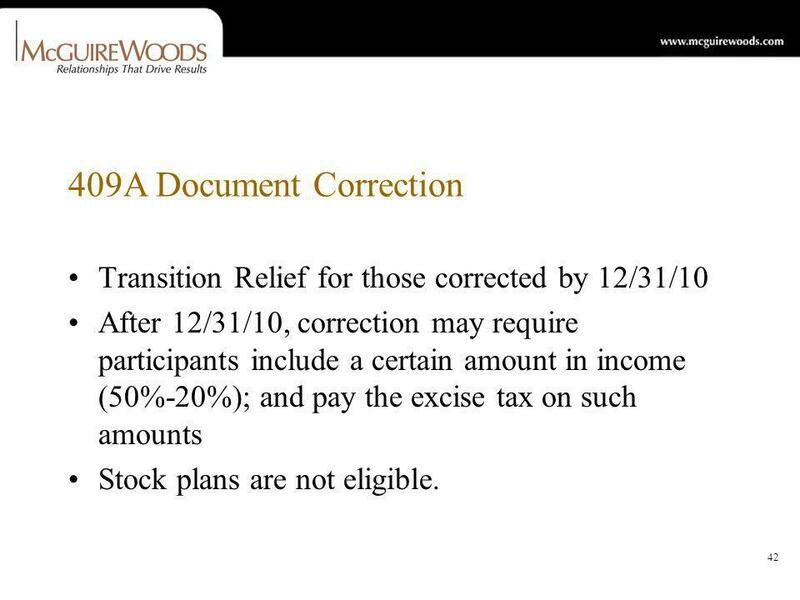 42 42 409A Document Correction Transition Relief for those corrected by 12/31/10 After 12/31/10, correction may require participants include a certain amount in income (50%-20%); and pay the excise tax on such amounts Stock plans are not eligible. 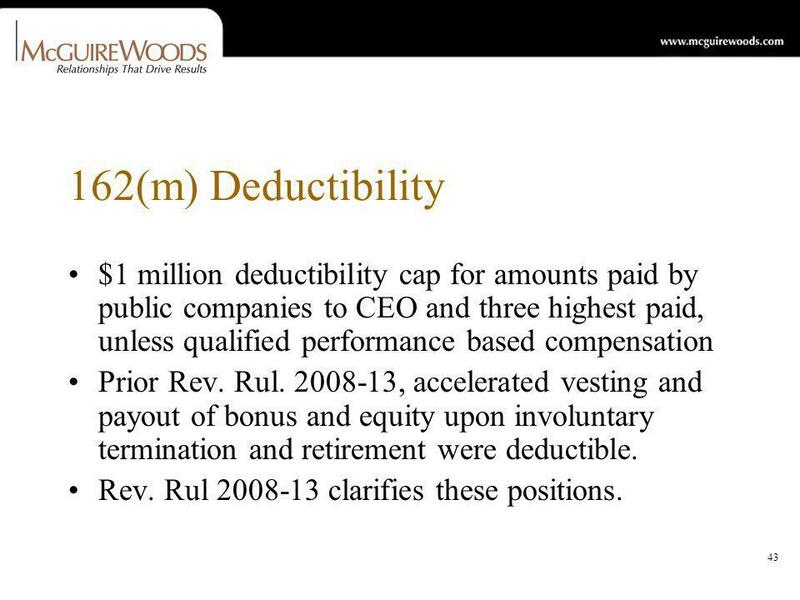 43 43 162(m) Deductibility $1 million deductibility cap for amounts paid by public companies to CEO and three highest paid, unless qualified performance based compensation Prior Rev. Rul. 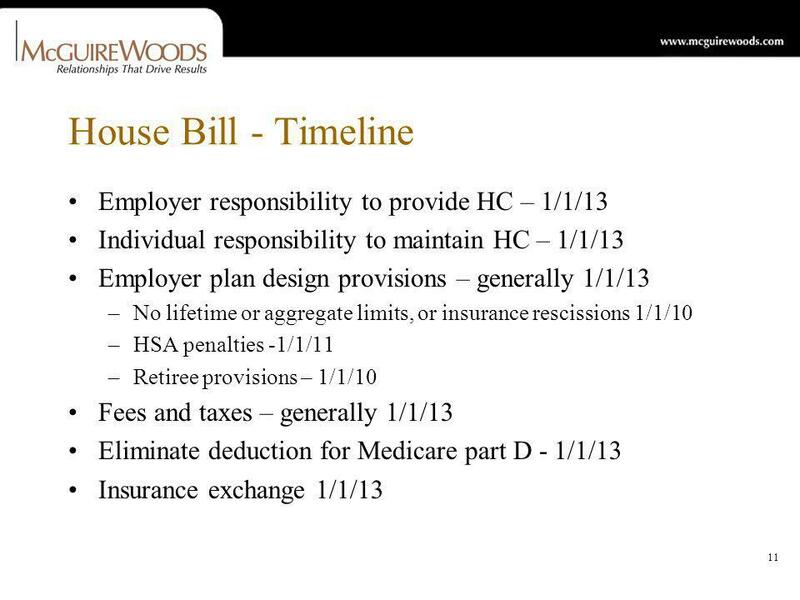 2008-13, accelerated vesting and payout of bonus and equity upon involuntary termination and retirement were deductible. Rev. 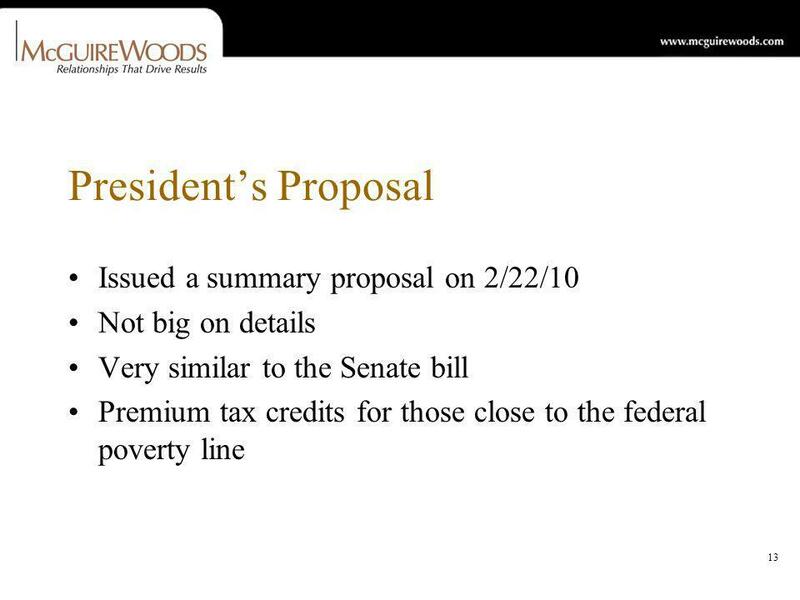 Rul 2008-13 clarifies these positions. Download ppt "1 New Developments Affecting Employee Benefit Plans The North Florida Chapter of the Association of Corporate Counsel February 23, 2010." 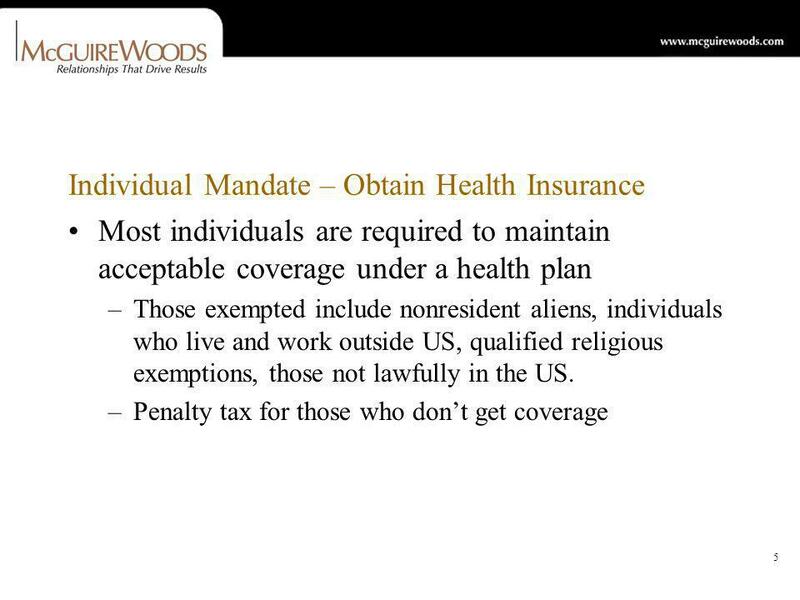 THE COMMONWEALTH FUND Rite of Passage: Young Adults and the Affordable Care Act of 2010 Sara R. Collins, Ph.D. Vice President, Affordable Health Insurance. 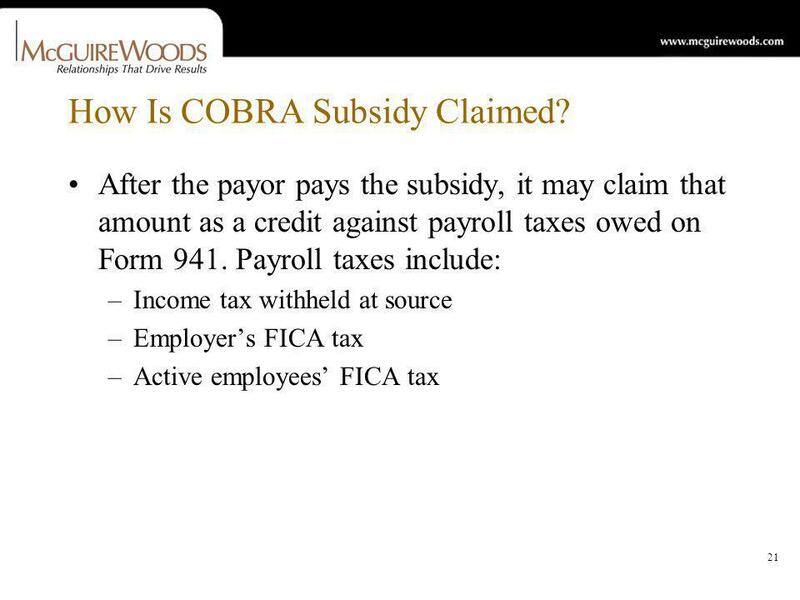 COBRA and the Health Reimbursement Arrangement. 2. ESB This is only a brief summary that reflects our current understanding of select provisions of the law, often in the absence of regulations.